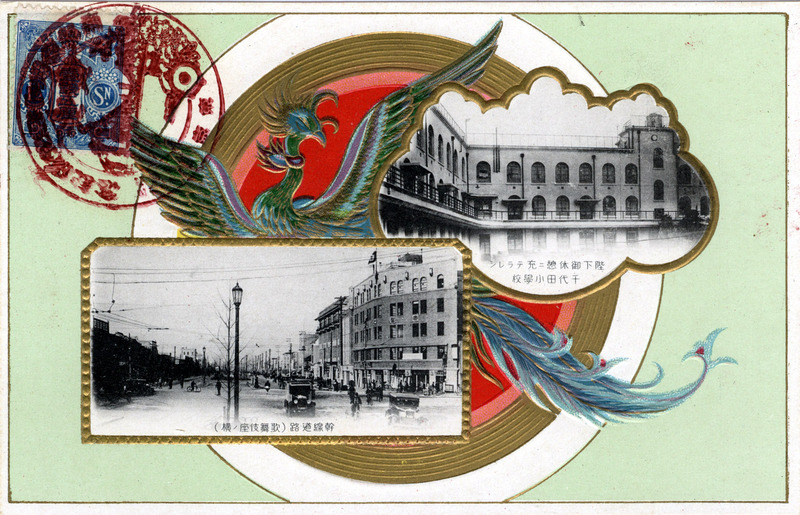 1930 Commemorative Postcard for Tokyo City’s Recovery (from the Kanto Great Earthquake). View of Hibiya from Shiba (left), and the new Kototoi Bridge at Sumida Park (right). 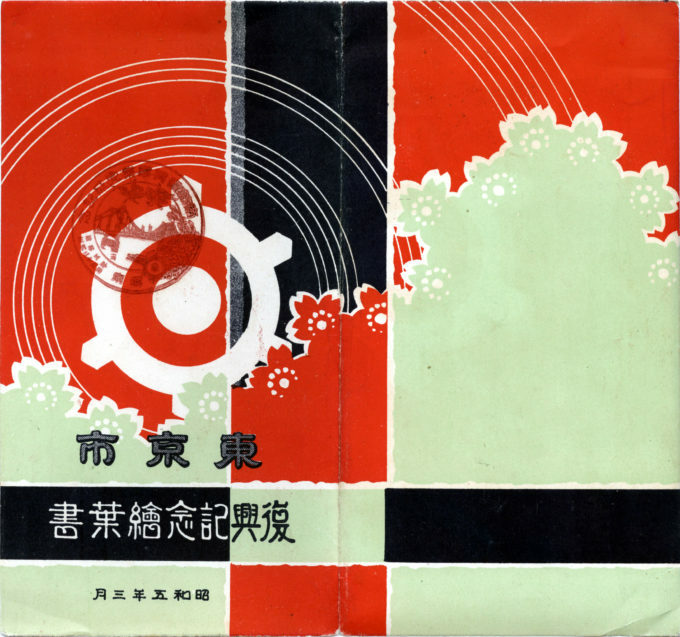 “On March 24, 1930, more than a million Tokyoites participated in the opening act of what became a weeklong series of events held to celebrate Tokyo’s rebirth [from the 1923 Great Kanto earthquake]. Beginning just after sunrise, throngs of people gathered near the imperial palace hoping to position themselves for a glimpse of the Showa Emperor as he embarked on a well-choreographed inspection tour of new Tokyo … The route that the emperor took and the sites selected for inspection provide many clues as to what municipal authorities believed were the meritorious reconstruction successes. 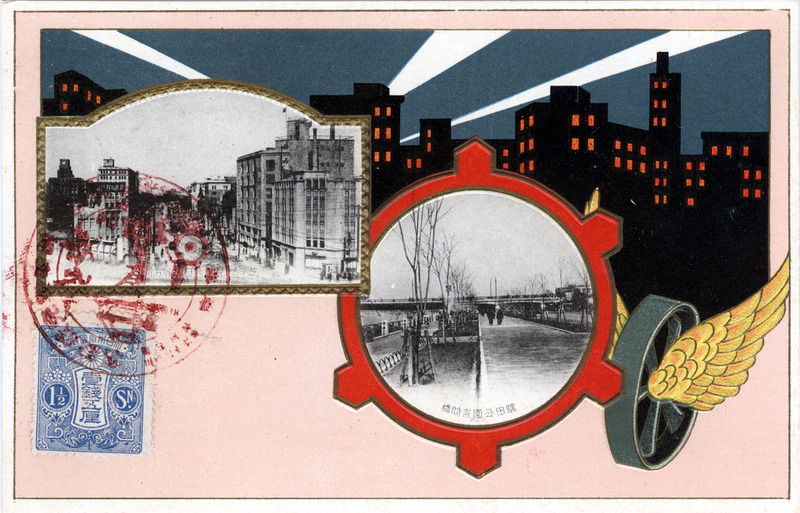 “The emperor’s motorcade traversed the Sumida River over four of the new six bridges – Kototoi-bashi, Kuramae-bashi, Kiyosu-bashi, and Eitai-bashi – heralded as great engineering achievements and exemplars of architectural modernity. The avenues selected for the motorcade included the widest, most magisterial new streets that Tokyo could offer any resident or visitor, including Showa-dori, Yasukuni-dorti, Asakusa-dori, Kiyosumi-dori, Eitai-dori, and Hibiya-dori. “… Three locations visited by the emperor, however, stood out in significance. To coincide with the moment the earthquake struck Tokyo, he made a personal inspection of the unfinished Taiso Earthquake Memorial Hall in Honjo Ward … From death and remembrance he next turned to life and the future of Tokyo by visiting the newly constructed Chiyoda Primary School in Nihonbashi Ward. During his daylong tour, the emperor spent more time at the state-of-the-art school than at any other location. He met with teachers and students and spent nearly an hour inspecting the three-story, reinforced concrete symbol of modernity. He took great interest in the exterior of the building, its classrooms, its public facilities, and a number of visual and material displays placed in its spacious auditorium. 1930 Commemorative Postcard for Tokyo City’s Recovery (from the Kanto Great Earthquake). The top inset shows Chiyoda Elementary School (which the emperor visited); the bottom inset displays Showa-dori, the arterial boulevard between Ginza and the Sumida River that was built as a firebreak. 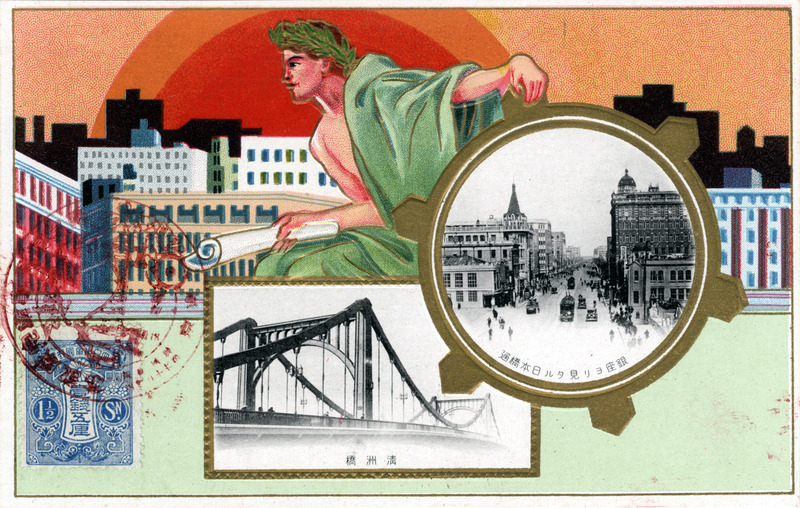 1930 Commemorative Postcard for Tokyo City’s Recovery, 1935, showing (left) Kiyosu Bridge, and the post-earthquake reconstruction of Kyobashi. 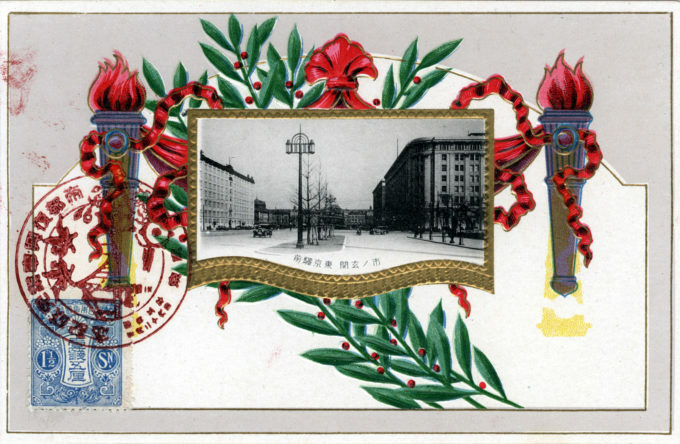 1930 Commemorative Postcard for Tokyo City’s Recovery, 1935, showing the plaza in front of Tokyo Central Station at Marunouchi. 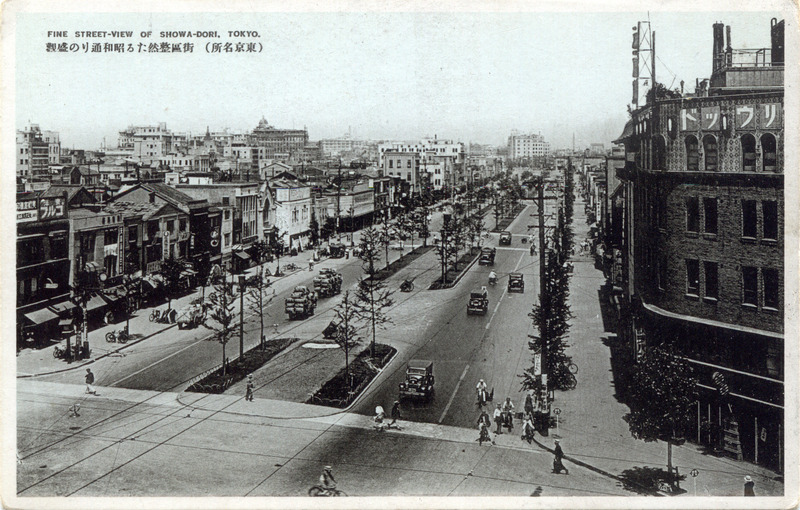 Showa-dori, Tokyo, c. 1930. The wide boulevard was built east of Ginza after the earthquake as a firebreak and named in honor of the then-current emperor.